Designed for an experienced sailor who plans to use her on Sydney Harbour, this yacht is designed to be both a casual cruiser and a fully crewed racer. Built from advanced composites over PVC foam she features a large teak soled cockpit laid out for both social and competitive sailing. 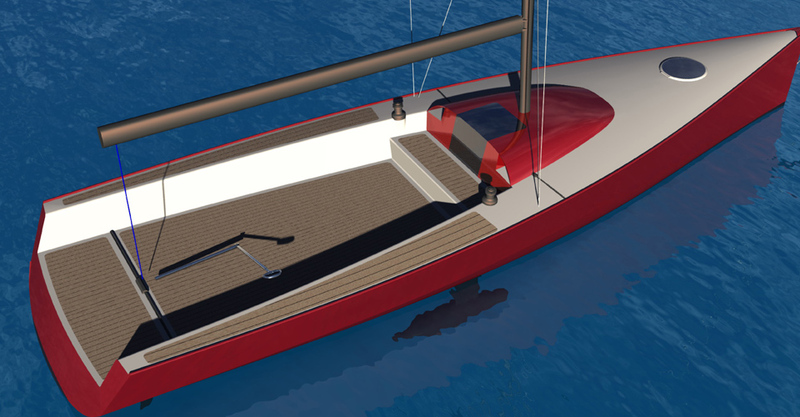 The sailplan is large and supported by a deck stepped, swept carbon rig with composite standing rigging featuring no backstays. 107% overlapping headsails are tacked partway along the fixed bowsprit, increasing the foretriangle area without raising the centre of effort of the sailplan. The large asymmetric spinnaker is flown from the same bowsprit and makes for good performance and simple sail handling. Underwater the hull is of maximum waterline length with a partially submerged transom at rest and generous beam with a well-defined chine running out abeam the mast. This hull form and the deep bulb keel provide the stability required to handle the power generated by the sailplan. VPP calculations predict very good speeds in all airs – in fact performance is predicted to easily exceed the benchmark Sydney38 on all points of sail, in all conditions. The keel, featuring a steel foil and low VCG lead bulb, is socketed into a stainless steel receiving plate recessed into the hull. This allows for easy keel removal for trucking to interstate events such as Hamilton Island race week. The rudder, consisting of a carbon stock and blade, is deep and of high aspect ratio, giving a high degree of efficiency and controllability. Below decks are moulded bunks port and starboard with a head forward. Provision is made for a small stove, sink and icebox if required just abeam the companionway. The deck-stepped mast allows the internal space to be relatively uninterrupted, maximising the potential for its use. Built into the companionway step, in the forward end of the cockpit, is a large insulated box, perfect for storing drinks. Propulsion is either through a Bukh 7hp saildrive located under the companionway steps or via an electric propulsion system. Electric propulsion involves the installation of a permanent battery bank, sized on the client’s endurance requirements. This bank drives either a fixed podded propulsion unit or a removable electric outboard again, depending upon the client’s requirements.